Good news for the Sikh campsite at Kuala Kubu Bharu (KKB) and gurdwaras in the state of Selangor. The Selangor state government gave RM200,000 to 18 gurdwaras for their upkeep and rehabilitation, the second consecutive year for such funding. At the same time, Selangor has also approved to drastically slash the RM1.9 million land conversion premium levied on Sikh Naujawan Sabha Malaysia’s (SNSM) campsite in KKB called the Khalsa Land. “Here’s an example of where the state government sat down, listened to us and understood why we need this piece of land…This is a celebration for all Sikhs, not just in Selangor,” Puchong Member of Parliament (MP) Gobind Singh Deo told a press conference in Puchong today. Also present was Selangor state exco member V Ganabatirau, who chairs the state permanent committee for poverty, caring government and estate workers. He sits in the Selangor exco headed by Menteri Besar Mohamed Azmin Ali. In 2015, The Selangor state government allocated RM130,000 to nine gurdwaras and one Sikh association. The 16 gurdwaras that received their cheques today were from Ampang, Kalumpang, Serdang, Sunway, Batang Berjuntai, Klang, Rawang, Port Klang, Rasa, Bukit Beruntung, Selayang Baru, Putra Heights, Kajang, Petaling Jaya, Setia City and Shah Alam. 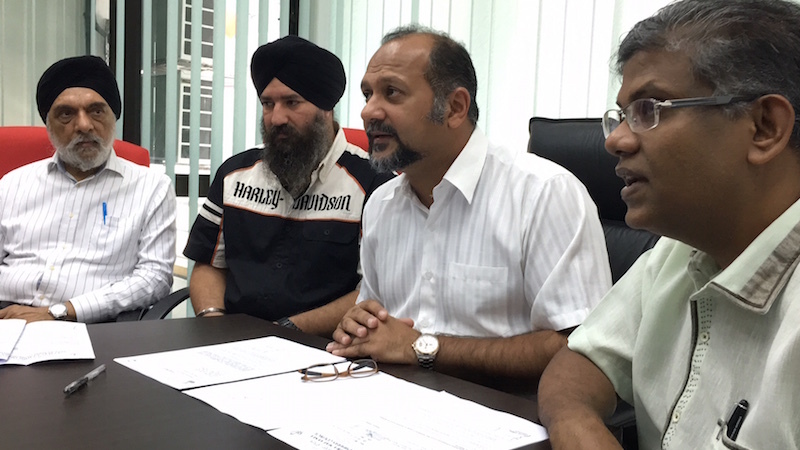 Gobind said he would also discuss with the Selangor state government on an annual funding for Sikhs in the state. On the Khalsa Land approval, Gobind said the move comes after an approval from the Selangor state exco, for which he thanked Ganabatirau for his ‘personal attention’ to the matter. Now, SNSM would only have to pay RM1,000 each for the four plots of land, and another RM192,650 for statutory requirement for drainage and related matters. On the future development at the camp site, he said: “We are not looking at the next year or two, but the next 10 or 20 years. I think, we as Sikhs, have to start appreciating the fact that we are growing in numbers. “If we can have an institute of learning, that bring our people together, and enrich them in terms of our cultural and religious history, that is something that all of us should work towards, and should support,” said Gobind. SNSM, an organisation set up in early 1960s and officially registered in 1967, bought a 22 acres piece of land in KKB, about 80km from the Kuala Lumpur city centre in 2002 for RM1.7 million. In 2010, the Selangor state approved the conversion of the land status from an agricultre to commercial, though they applied for institutional use. A levy of RM1.9 million was charged for the move. A team from SNSM has been at work since then to obtain a waiver, which would allow the organisation to use its funding towards developing the camp site. I think the Perak State Government should also give some donation to the WADA GURUDWARA IPOH to enable them to buy towels for the GURUDWARA and also clogs for the toilets.I think the GURUDWARA do not have enough money. The accounts are generally audited but the audit may be more finance oriented. What is needed about construction projects is for GMCs and Internal Auditors to have expertise which is relevant to CONSTRUCTION ASPECTS and be aware of the FINANCIAL IMPLICATIONS OF TERMS AND CONDITIONS AND OF ADVICE OF PROFESSIONALS. Only then can management-implementation-monitoring can be done by COST EFFECTIVE and COST EFFICIENT MANNER. Above views are not to state that anyone is involved or point fingers at anyone but STATEMENT OF CULTURE so that PREEMPTIVE ACTION CAN BE TAKEN TO PREVENT AVOIDABLE COSTS inany CONSTRUCTION PROJECTS which includes PROCUREMENT and FEES AND CLAIMS BY APPOINTED PROFESSIONALS. The Selangor Sikh Sanggat thanks the Selangor State Govt forits consideration of the financial needs of Gurdwara buildings and facilities. Now it is the duty of the receipient Gurdwaras MC to be TRANSPARENT AND ACCOUNTABILITY OF THE RECEIVED AND TO BE RECEIVED FUNDS IN FUTURE. Financial management of such grants-donations should be made public and not subject to RAHSIA under OSA.